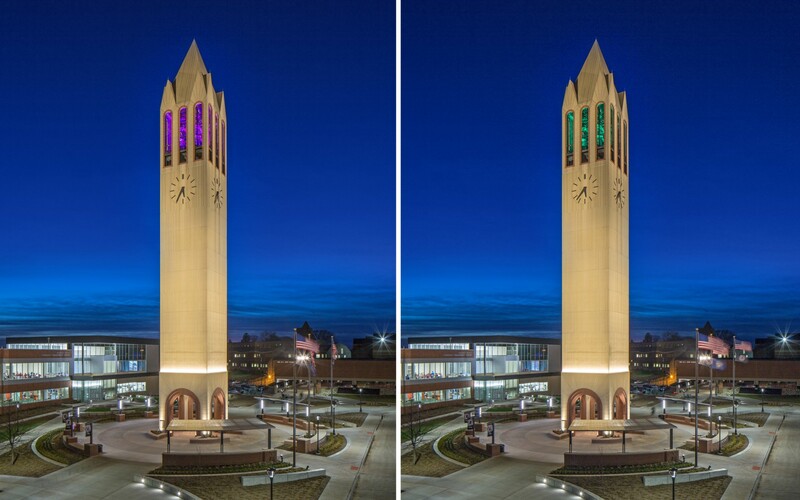 The Henningson Memorial Campanile has been an iconic centerpiece of the University of Nebraska Omaha (UNO) campus since 1989. The 168-foot landmark features 47 bells inside of the bell chamber. Lumenbeam XLarge luminiares in 3000K and RBGW were used to floodlight the chamber, revealing the bells and creating a beacon seen from the distance. 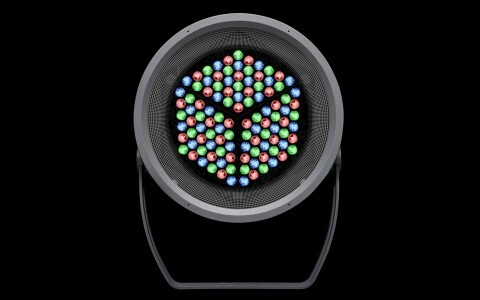 The result is a cost-effective lighting design that reduces energy consumption and maintenance. 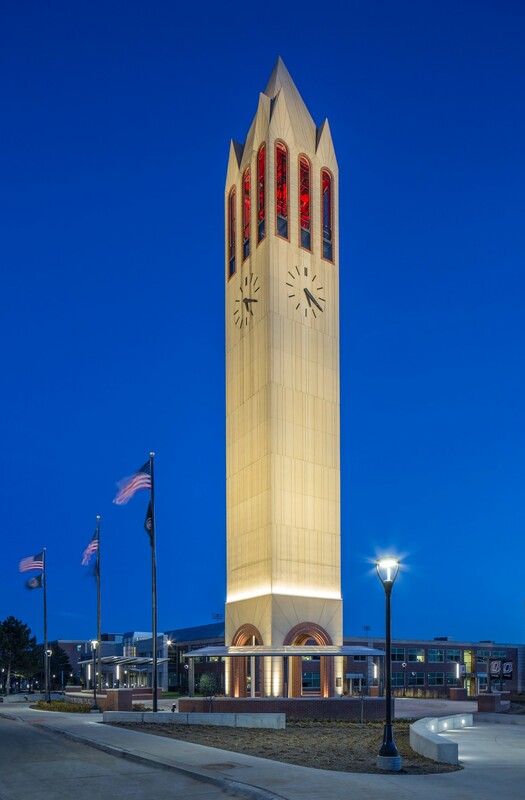 Morrissey Engineering used Lumenbeam XLarge Color Changing luminaires to increase flexibility and improve the quality and consistency of light at the Henningson Memorial Campanile. The idea was to provide a kind of amber color to highlight the color of the bells, and RGBW allows flexibility to change it for different events. It stays true to the tower’s purpose as a memorial. The Henningson Memorial Campanile has been an iconic centerpiece of the University of Nebraska Omaha (UNO) campus since 1989. The 168-foot landmark features 47 bronze bells, weighing 2.5 tons and each containing an inscription from members of the Henningson family. 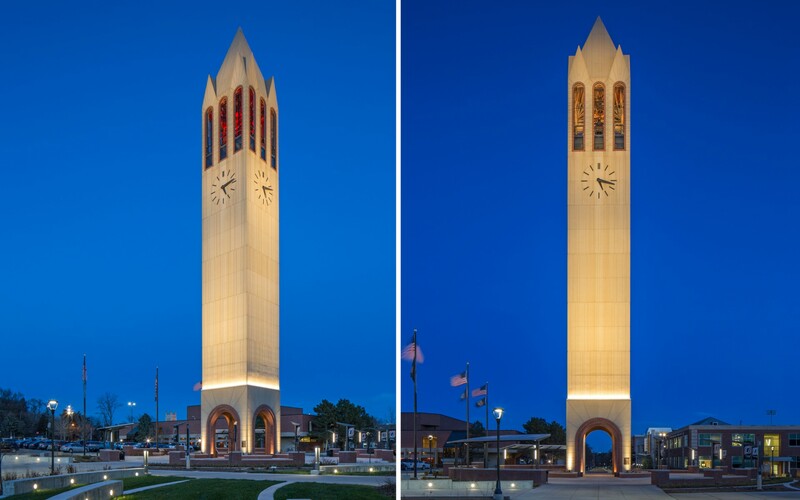 "The tower was previously illuminated by HPS floodlights, resulting in poor color rendering and uniformity,'' says Toby Samuelson, Electrical Project Manager and Senior Lighting Designer at Morrissey Engineering. 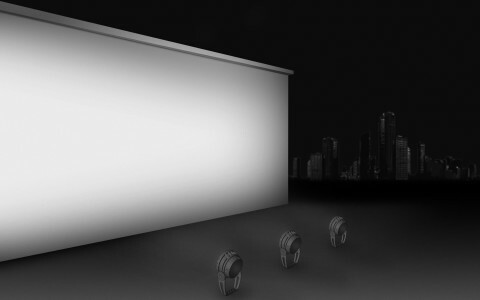 To keep these unique features in the spotlight at night, the firm conducted a number of tests to determine the optimal level of lighting required. "High-dynamic range imaging was performed to measure existing luminance levels and to determine a baseline criteria for the new lighting,'' says Samuelson. The luminaires were roof-mounted on four surrounding buildings and two parking lot poles. Offsets varied at each location, so multiple optics were used to achieve an average of 10 fc (100 lux) and uniformity ratios of 4:1 Max: Min across the 168 feet facade. ‘'Lumenbeams were used to light the tower, and the narrow 6 & 10 degree optics keeps the light focused on the tower without spilling onto adjacent buildings,'' says Samuelson. 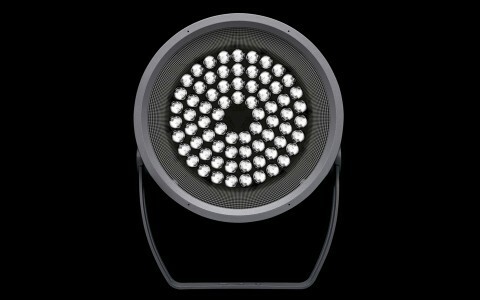 The luminaires were equipped with cross-baffled snoots to eliminate glare, with the precise optics maneuvering the light evenly, further preventing any spilling. Previously, the bell chamber was hidden from view, veiled by a black screen during daytime and shrouded by darkness at night. Morrissey Engineering used Lumenbeam XLarge Color Changing to internally light the chamber, revealing the bells and creating a beacon as seen from the distance. ‘'The idea was to provide this kind of amber hue to highlight the color of the bells, and RGBW allows flexibility to change it for different events. It stays true to the tower's purpose as a memorial'' says Steve Gollehon, Lighting Designer at Morrissey Engineering. 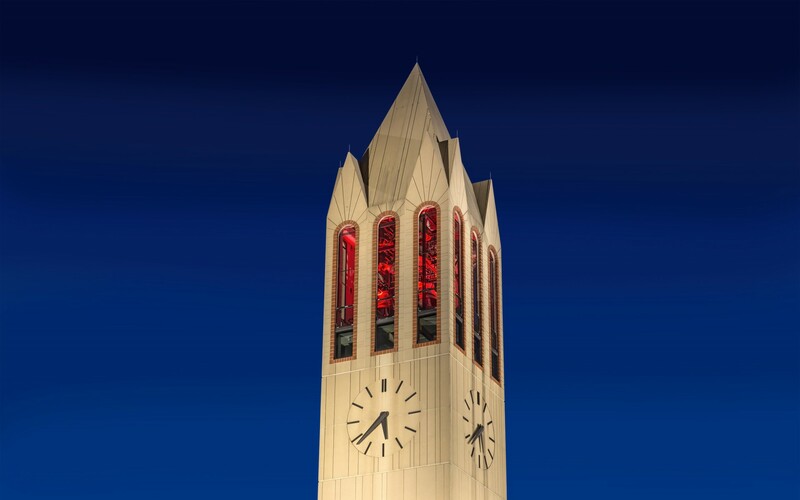 The Henningson Memorial Campanile is now more dazzling than ever, with a cost-effective lighting design that reduces energy consumption and maintenance.